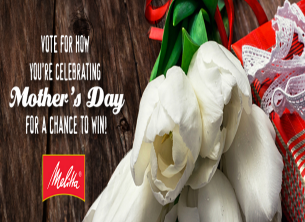 Melitta® USA “How You’re Celebrating Mother’s Day” Sweepstakes – Win a $100 Amex card & more! Win a Gourmet Melitta basket & a $100 American Express gift card (2 winners)! ENTER SWEEPSTAKES HERE – Melitta Facebook page. ENTRY LIMIT – Entrants can enter themselves in the Sweepstakes once and can only win once per 12 months. ELIGIBILITY – Open to residents in the United States of America, 18 years of age and older as of 4/15/16. SWEEPSTAKES ENTRY PERIOD – Promotion begins on/about 4/15/16 and ends on/about 4/29/16, or sooner, at the Sponsor’s sole discretion. PRIZES – Melitta® USA, Inc. will select two (2) prize winners in a random drawing from all eligible entries received within the Entry Period. Each Prize Will Consist Of : A Gourmet Melitta Basket And A One Hundred Dollar American Express Gift Card. A Gourmet Melitta Basket Consists Of A 12cup Fast Brew Coffeemaker, Five (5) Coffees From Melitta’s Premium Café De Europa Line, Cone Coffee Filters, Two (2) Mugs And A Handheld Milk Frother.